Culberson County-Allamoore ISD Board of Trustees met in Regular Session on Monday. Trustees unanimously approved the three-year contract renewal for Superintendent Ken Baugh. 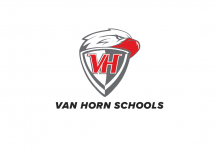 Baugh has been instrumental in creating the “Van Horn Vision” to develop a collegiate high school and STEM Academy securing many grants and partnerships to facilitate the realization of this vision. Baugh has also been tasked with overseeing the construction of the new K-12 campus. The Board also approved the staffing recommendations as recommended by Baugh with more details to be released at the April 15 meeting. Marcia Crowley presented members of the UIL Academic Team to the Board noting that they will be advancing to the Regional Meet in Odessa on April 13. The members introduced themselves and shared their results from the District meet. The Trustees expressed pride in the accomplishments of this talented group of students. The Trustees accepted an application for a Value Limitation Agreement from Delaware Processing LTD under Chapter 313 of the Texas Property Tax Code. This is the third application for a gas plant to be built in northeast Culberson County. Delaware Processing LTD proposes to build a 250 mgd gas plant with construction to start in 2019. Supt. Baugh will review the application for completeness and submit it to the State Comptroller. The District also retained the services of Powell and Leon (legal) and Jigsaw School Finance Solutions LLC (financial) to assist in the review and process of the application. The Trustees received an update on the K-12 Campus construction project from HB Construction Manager Manuel Quinones. He reported that the grading for parking and sidewalks is underway, and sidewalks are being poured. The construction is staying on schedule with “substantial completion” scheduled for July 3. The Board approved the 2019-2020 School Calendar with the first day of school scheduled for August 26, 2019. Supt. Baugh reported that the grand opening and dedication of the new K-12 campus is scheduled for August 17, 2019. Held an executive session with no action taken. Approved consent items, noting the tax collection rate of 97.79%. Adopted updated Board Policy CCGB (LOCAL). Acknowledged the Conflict of Interest Policy. Approved a tax sale as presented by the CCAD.